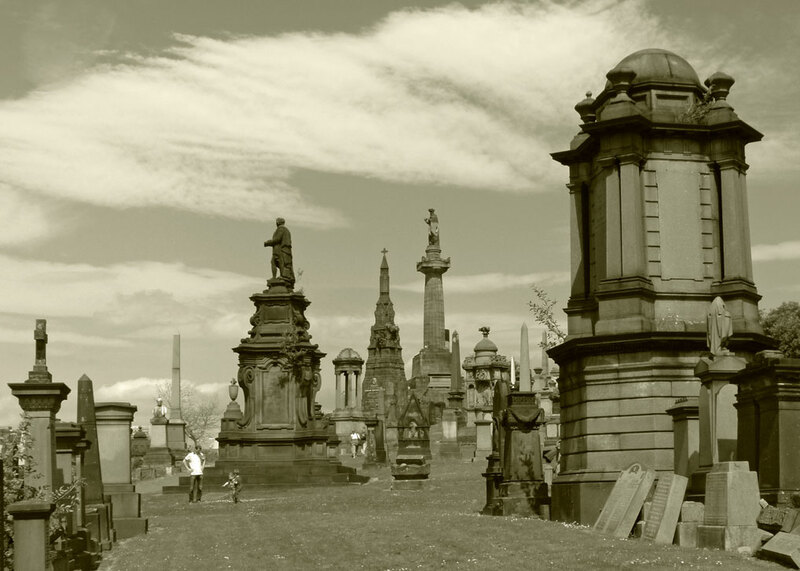 Glasgow has its very own City of the Dead, a monumental testimonial to the Victorian age on a hill beyond the Cathedral of St Mungo. It is an astonishing cemetery, a 37 acre site containing the remains of some 50,000 souls. 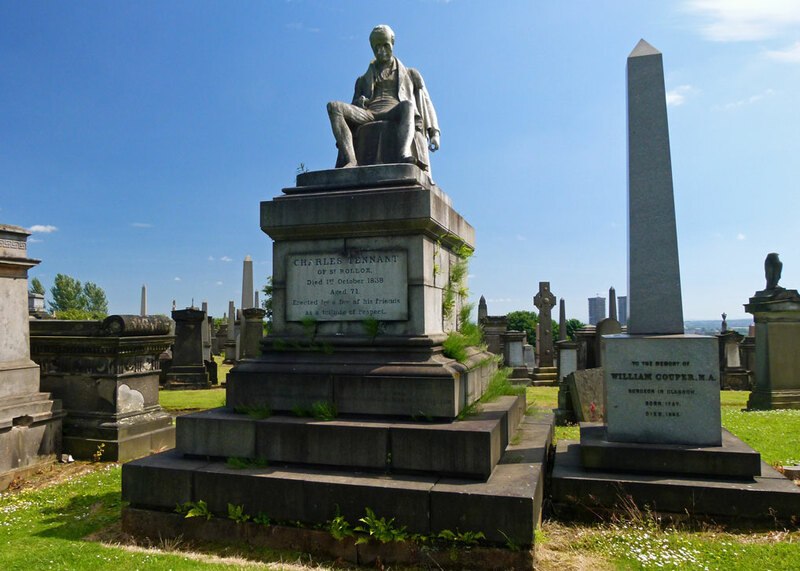 Of course, the great unwashed majority lie in pitiable obscurity, but there are about 3,500 tombs (some of them up to 14 feet below ground) and extravagant memorials, altogether a shrine-like who’s who of Victorian Glasgow, when it was known as the second city of the Empire. This vast resting place for the departed is a suitably historic spot. Here, it is said, the Druids had a sacred grove, and in the Molendinar Burn, which now flows beneath neighbouring Wishart Street, St Mungo once fished for salmon and baptised converts. Close by, in 1305, the Anglo-French Aymer de Valence, 2nd Earl of Pembroke, negotiated the betrayal of William Wallace by his fellow Scot, Sir John de Menteith. The land was bought by a group of the City’s most powerful traders, the Merchants’ House, in 1650. By the early 19th century, it had become a popular local recreation area, Fir Park. But, inspired by the Pere Lachaise cemetery in Paris, it was decided to transform it into an interdenominational, and profitable, burial ground. And so it was, with the first committal taking place in 1832. You’ll find Glasgow Necropolis by going through some wonderful cast-iron gates off the intriguing Cathedral Precinct, behind St Mungo’s Museum of Religious Life and Art. The gates were cast by the local Edington Foundry in 1838 and include the symbol of the Merchants’ House, a clipper sailing over the globe, with the motto toties redeuntis eodem – so often returning to the same place – which in the circumstances may be considered a little morbid. 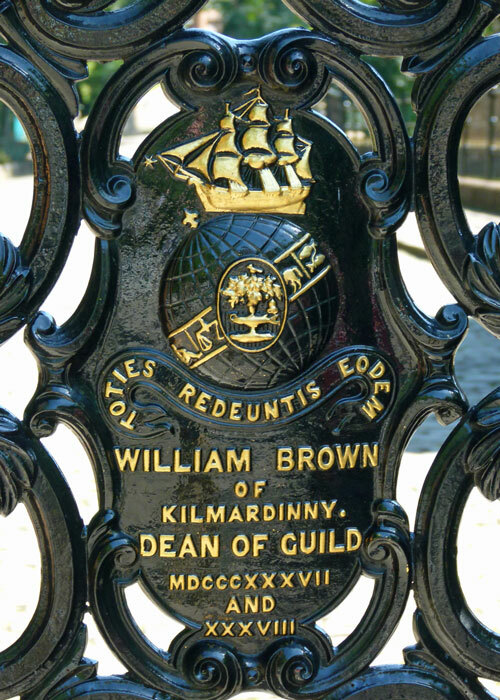 The gates name-check William Brown of Kilmardinny, who was Dean of Guild (responsible for the care of buildings) at the time and whose obituary described him as an ‘active citizen, as well as an energetic man of business’. Glasgow has its own Bridge of Sighs too. Named for being the route the funeral processions took, the bridge spans the Molendinar Ravine (really, it is more like a shallow railway cutting) and busy Wishart Street and is your path to the Necropolis. It is a compelling walk; cemeteries can be compelling places. 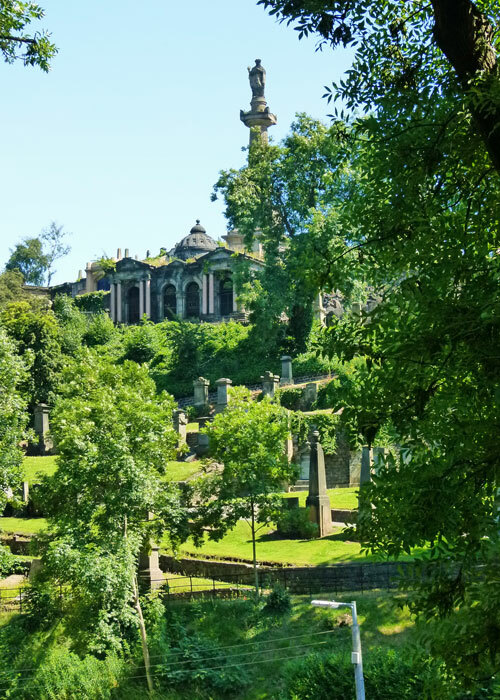 But there is something almost breathtaking about Glasgow Necropolis as you step onto the bridge and grasp the enormity and content of the view ahead. You can see why it might be called a city of the dead. 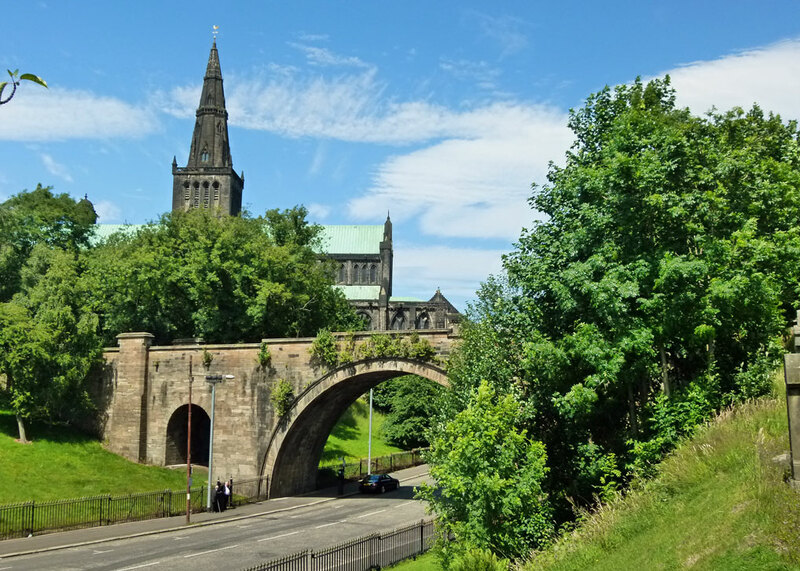 It doesn’t help to be overlooked by the towering reputation of John Knox, hard-line leader of Scotland’s 16th century reformation, whose memorial (erected in 1825) points 200 feet heavenward on the highest, and most sought-after, part of the hill. Knox is actually buried under what is now the car park (parking space No 23, to be precise) at St Giles’ Cathedral, Edinburgh; but surrounding him (so to speak) are Glasgow’s Victorian movers and shakers – industrialists, merchants, churchmen – all brought together in death and gazing out over the city they shaped in life. 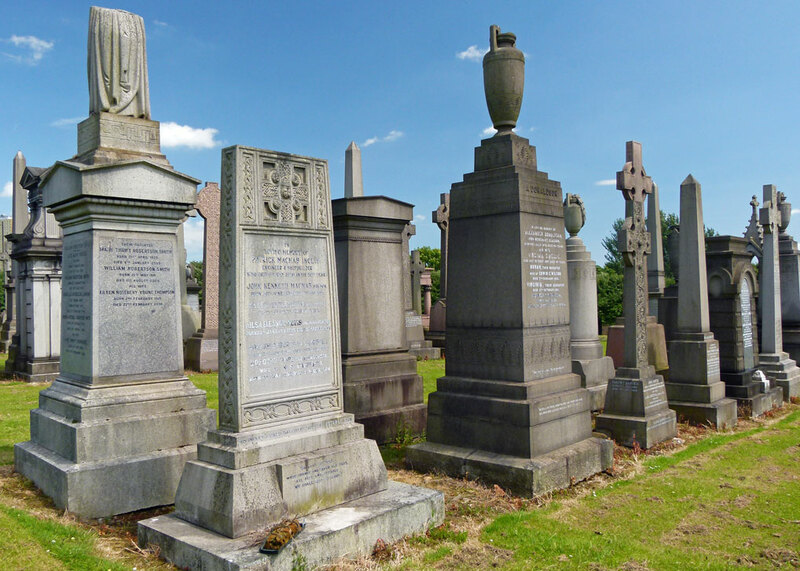 The layout of Glasgow Necropolis is fairly informal, but some of the monuments are colossal and, to modern eyes, nauseating in their opulence. So much wealth spent commemorating those who, to be fair, are largely unremembered outside Glasgow and their time; so much that could have brought a little relief in a city where the poverty of many contrasted with the affluence of a few; but I guess the stonemasons did OK out of it. Countless monuments owe their design to classical influences from ancient Greece and Egypt. Allegedly, the place is also steeped in the iconography of freemasonry – whatever that means; I have always been slightly suspicious of people who need to hide behind arcane symbols, but I guess it keeps the conspiracy theorists and Dan Brown happy. 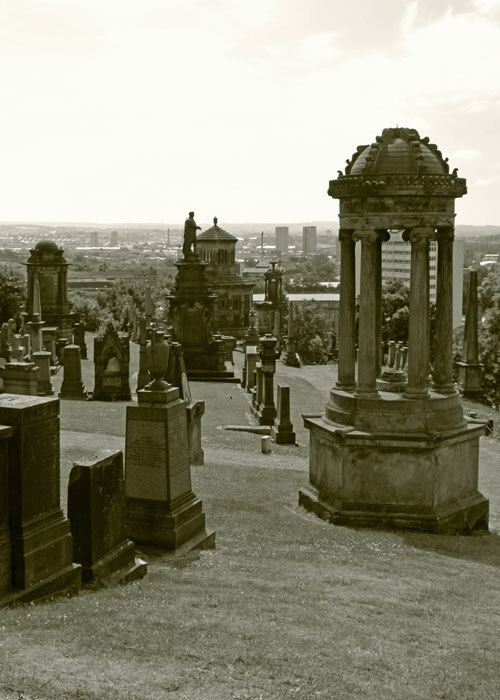 Despite the grandeur of Glasgow Necropolis, there is an inevitable air of sadness about it. A great number of the tombs are following their inhabitants into decay; there are alarming gaps in some, and weeds sprout from cracks and crevices like unwelcome body hair. The slightly surreal feeling as you wander through well-mowed pasture, reluctantly admiring shrines and surrounded by the long-dead, is exacerbated by kids playing in and out of the stones, people having picnics and walking their dogs. Again, I do not criticise; do the dead prefer laughter to tears? One almost feels it might be better not to mow it and let nature take it over, since the tombs are decaying anyway. Quite a place. The first photo put me in mind of a silent movie. What a place. A fascinating place. I had not heard about it before. A remarkable place. We did visit the Cathedral there, so I have vague recollections of seeing the Necropolis across the street. More monumental than most! Wow that is an impressive cemetery. I have wanted to visit Highgate cemetery for many years but never seem to get around to it, maybe this year. Well that was certainly interesting reading! I’d love to wander through that cemetery. I think a cemetery is a perfect place for a quiet picnic. Nice history. 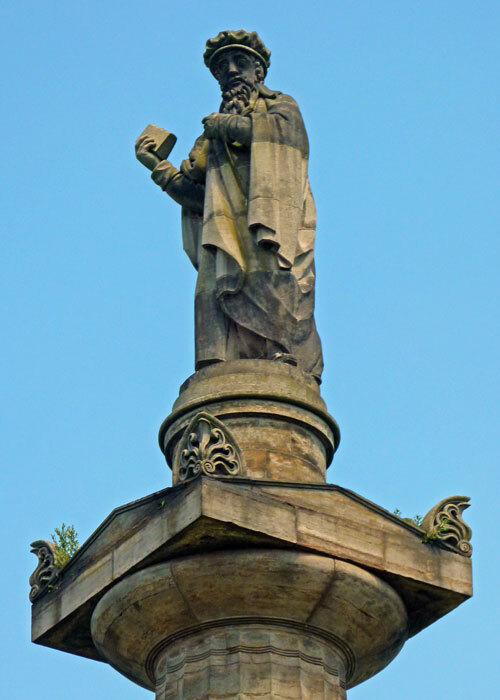 Walking down Duke Street recently I was amused to see that from certain viewpoints John Knox appears to be blessing the nearby Tennents Brewery as his statue lines up perfectly, bible in hand, above the giant four cans;placed outside the factory. I was also amused to note that one of the crypts had a famous (Shakespearean maybe) actor lauded underneath by his Victorian fans with the words “his skill, acting, legendary performances and his bold character will never be forgotten.” or words to that effect. Needless to say I’d never heard of him. I wonder who will be remembered from our era 200 years down the line? Even people who were famous in the 1960s I’ve noticed are starting to fade into obscurity now and disappear from memory surprisingly quickly. Makes you think wandering around that place about the fleeting nature of fame for most. Good point, Bob. Fame has a limited shelf-life for most people. I will definitely have to visit this place at some point in the future, thanks for sharing! What an interesting place, love to read epitaphs. I always find cemeteries to be very peaceful. There are a couple of larger ones here that I should really visit in the spring. I think I would like the company if I was a resident! We may actually get to see this. We have a two week trip to Scotland booked for the end of Sept into October. Before we go I’ll make a point of reading through your index to see what other Scotland sights to see. Let me know if I can be of any help before you go, Marcia.